Google is now getting more blatant with its lobbying, having endured a litany of counter-lobbying, some of which from Microsoft scuppered its Yahoo (NSDQ: YHOO) ads deal. Google’s nose isn’t clean in Europe — earlier this month, the commission disbanded an expert group of five privacy experts, comprising Google chief privacy counsel Peter Fleischer, that was set up to review data protection legislation, after deciding too many of the members were American. Google also has a vested interest in Firefox, which uses Google as its default search provider; Mozilla also backs the EC’s case. I also think firefox is the best browser yet and google chrome is still on beta stage, which needs more improvement. Firefox is the best browser to use….no other browser has it's adaptability…so many interesting plugins for it…I haven't seen that in Chrome.. It is not a witch hunt, but consumers should have options. Internet Explorer is the main cause of stability problems in Windows. It does not have any protection against viruses and malware. 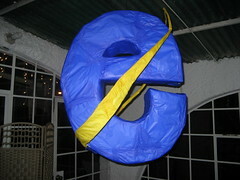 Internet Explorer does not give even a virus warning, as does Firefox and other more advanced browsers.